Interestingly, they used the same advertising for their line of laxatives. They want me to die? I try staying in the nature, but I keep getting arrested. The Nature seems to be a cult leader. Only The Nature can make you complete. This is for those of you who feel magnetically attracted to nature. Don’t you DARE think about leaving the nature or god help you, you’ll regret it. After attracted to the butterfly, the bear becomes stainless. Oh, nature’s calling…let me get my magnets. You cannot Escape The Nature! Does a bear magnet make the nature in the woods? If a bear is stainless in the woods does a butterfly stick or flap it’s wings in the amazon? Nothing says “nature” like stainless steel refrigerator magnets. what the hell am I going to do with all this stain remover now! If a butterfly magnet flaps its wings in the nature, a magnetic field occurs in the rural. Because nothing says “nature” like a mass-produced stainless steel magnet! The nature won’t let go of me, even for grape juice and cracker time! Help! 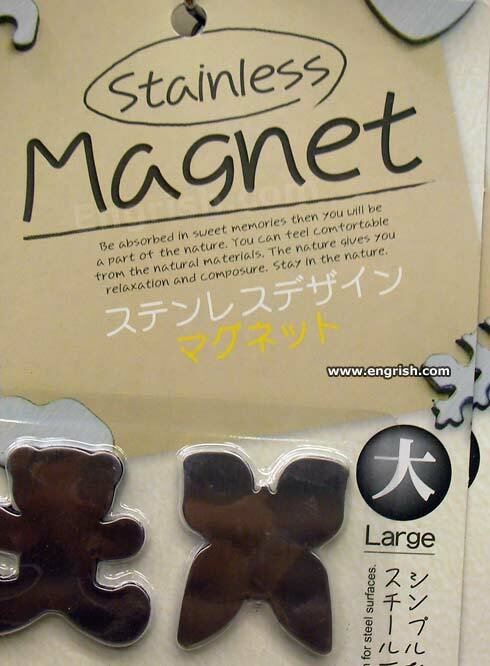 Rest assured, these magnets won’t stain…. can i just stay in my recliner and watch nature shows? i’ll feel like part of it without having to leave a big comfy safe place. Gee, I’d hate to see the small ones..
Now in a handy face wipe. As nature intended beyond this point.Come,fellow naturist.